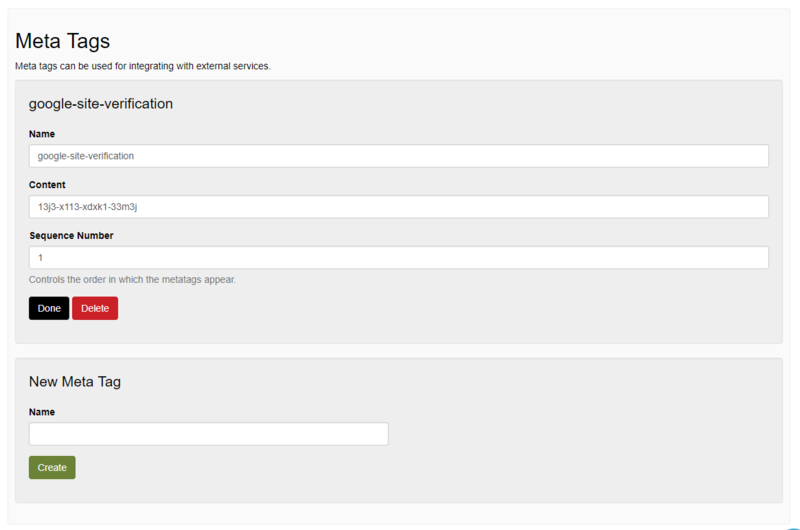 You must be logged in to create and manage conventions. You can create or manage your account here. You must be a member of a group to create a convention. Groups are used to delegate privileges among other things. You can create a group here. A group needs a name and a location. The name could be the same as the name of your convention, or it might be the name of your local game group. The location is a City, State combo like "Madison, WI". 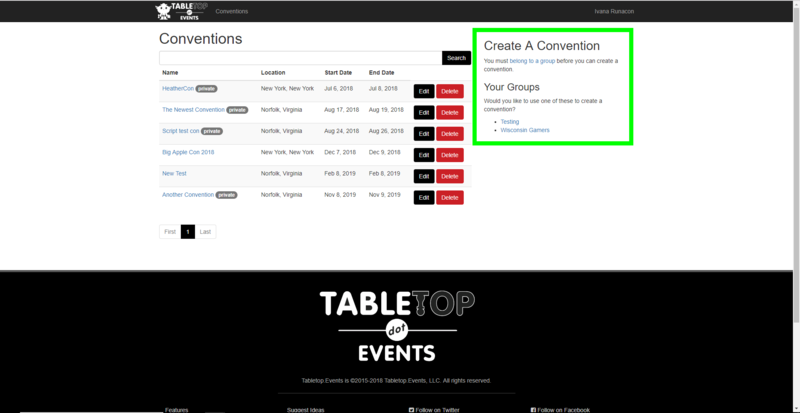 From your group's page under "Group Tools" you can click on the "Create a Convention" link. Or, you can go to the Conventions page. If you go to the conventions page you'll need to select a group that you want to create the convention in. Your list of available groups will be displayed below the create convention form. Your convention needs a name and a location. The name should be the name of your convention plus the year. For example "Big Con 2017". The location will by default be the same location as your group. However, if the convention is in a city other than where the group is from, you should change it before creating the convention. 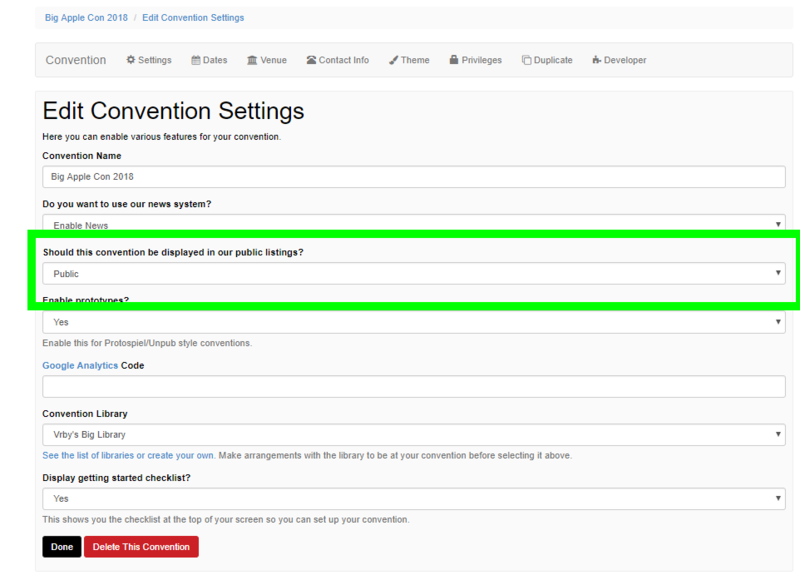 To make a new convention you will go to your profile then you will click on “Conventions” in the top bar of the site. This will take you to a list of the conventions you have made. To make a new convention you will first need to make a new group for that convention. Click on the link in the paragraph below “Create A Convention” that says “belong to a group” or you can use a group you have created previously in “Your Group”. You will be taken to a screen where you will Enter the Name of your Convention and the Location of the Convention. 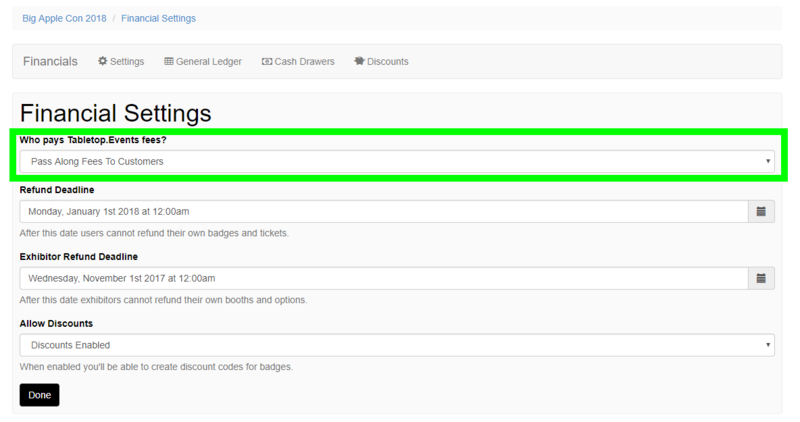 After you have Entered the name and location of your convention you will Click the Black “Create” Button. Or you can click on the link in the checklist. When setting up your conventions days you will set when each day of your convention starts and ends not the day it will start and the day it will end. For example, if your convention starts on a Friday August 24st 2018 at 10am you will select that as the first section. Make sure to select the hour then if it starts on the hour or at a time within that hour. In the second section, you will select the end time for that same day for example Friday August 24st 2018 at 11PM . You will then name the day, you can either name it the day of the week or something like Day 1 whatever works best for you. Then hit the Green “Create” button. After you hit the create button another field will pop up with the next calendar day automatically filled in and the same times that were entered for the previous day. You can change the times selected and centime this process for all the days your convention will run. 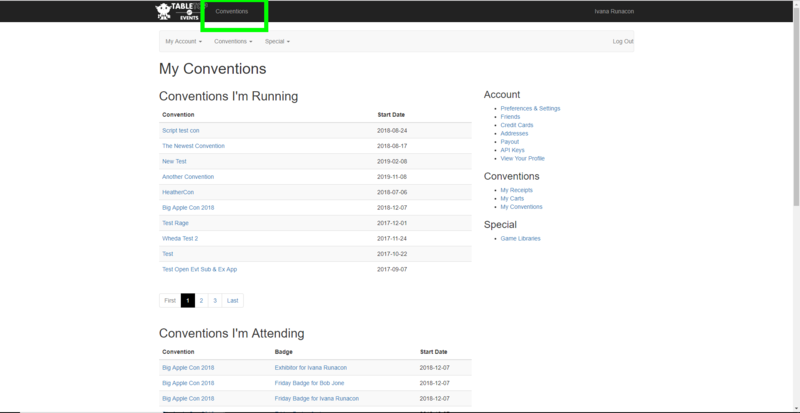 When you have entered all the days for your convention you will hit the black “Done” button at the bottom of the screen. 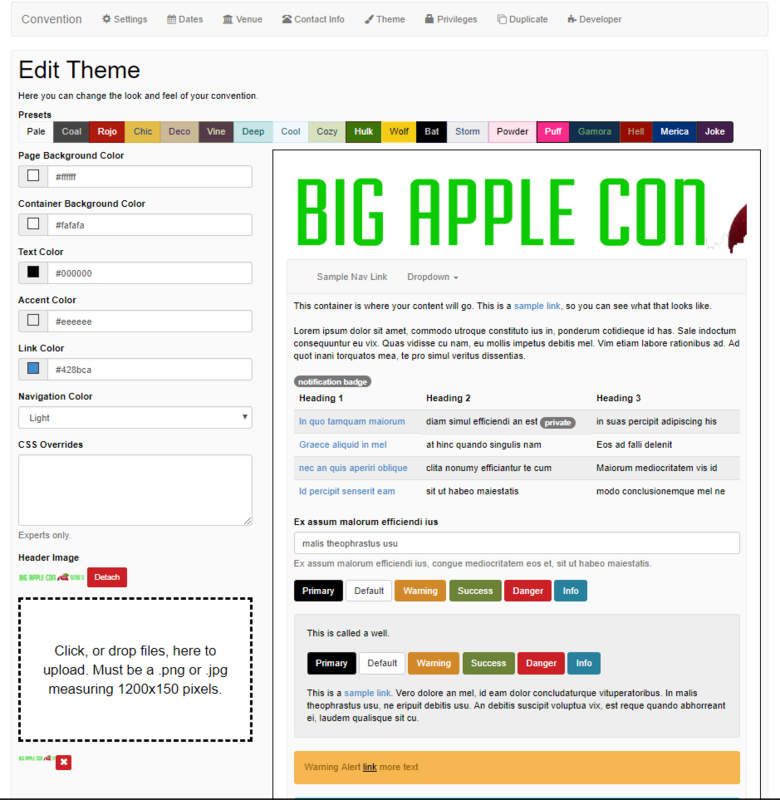 Next, you will create the Create Front Page Content for your convention. This is the information your Attendees will see first when they go to your site. On this page, you will enter the information about your convention and you will load any images for your convention. While you are entering information and loading images you will see a preview of what the page will look like on the right. 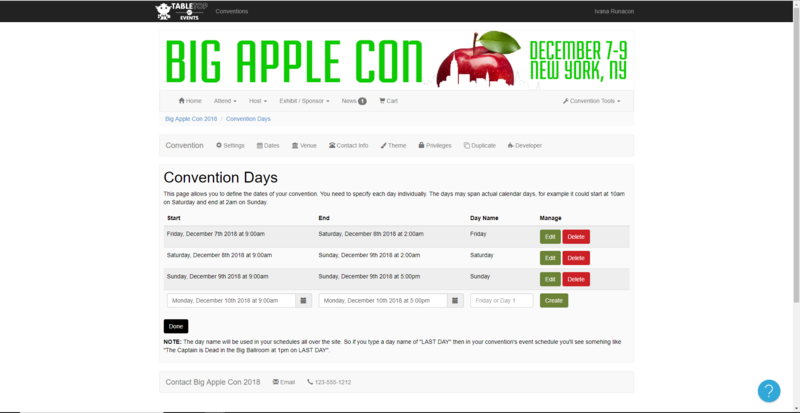 After you have entered the information about your convention you will hit the Black “Done” button. 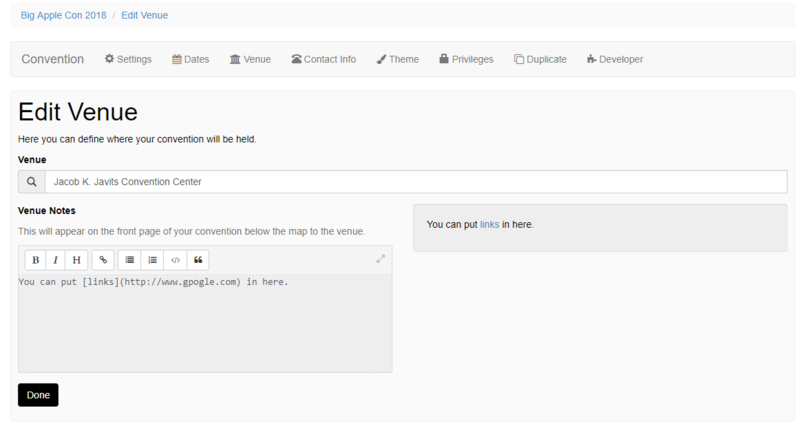 This section will bring up a map on the front page of your convention showing where the convention will be held. You will search for the name of the location of where the convention will be held. 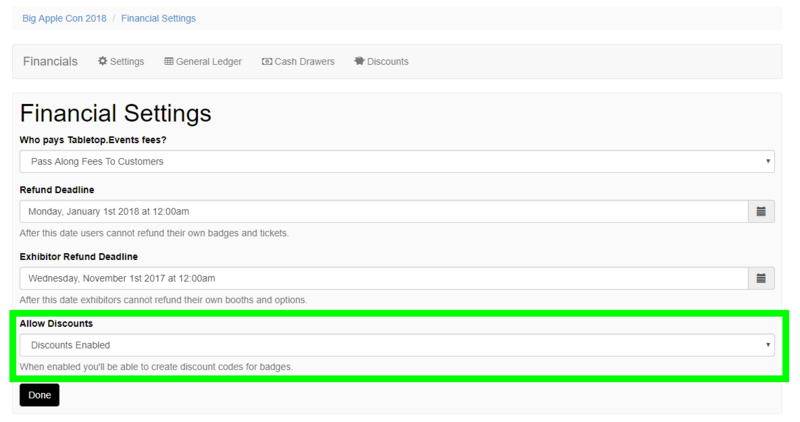 You can set the Refund Deadline by going to “Convention Tools> Financial > Settings”. Most conventions will set this deadline to a week before the convention starts. Up until the deadline your Attendees will be able to refund their own orders, then after the deadline you will need to manually issue refunds. NOTE: Items that are free are able to be refunded at any time before or after the deadline. 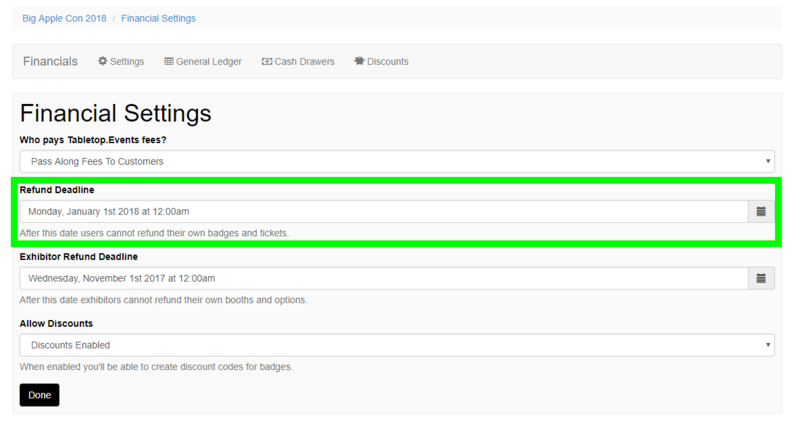 On the same page “Convention Tools> Financial > Settings” you will decide if your convention will Absorb the Fees from TableTop Events or if you will pass the cost on to your Attendees. We see about a 50/50 split of conventions passing on the fees to conventions absorbing them. There are no hosting fees, administration fees, licensing fees, module fees, or monthly fees of any kind to use Tabletop Events. 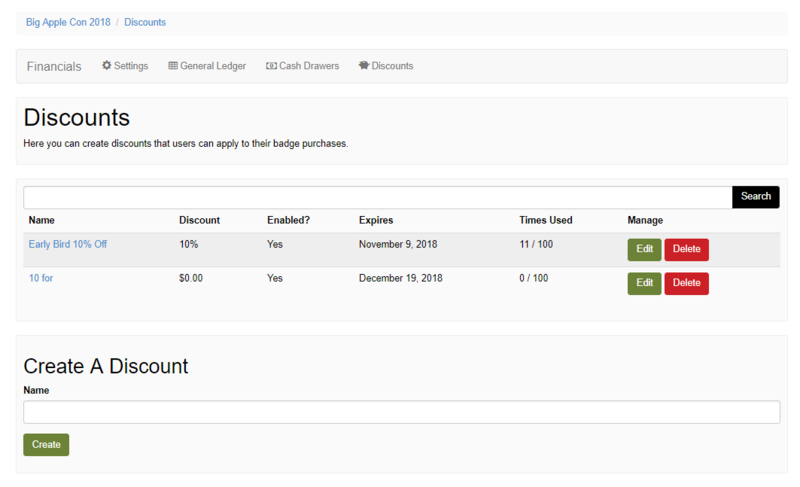 The only time you or your Attendees will be charged, is when something is purchased thru the site. If your convention is a free convention and you make all the items in your convention $0 then there will be no fees to use the site. 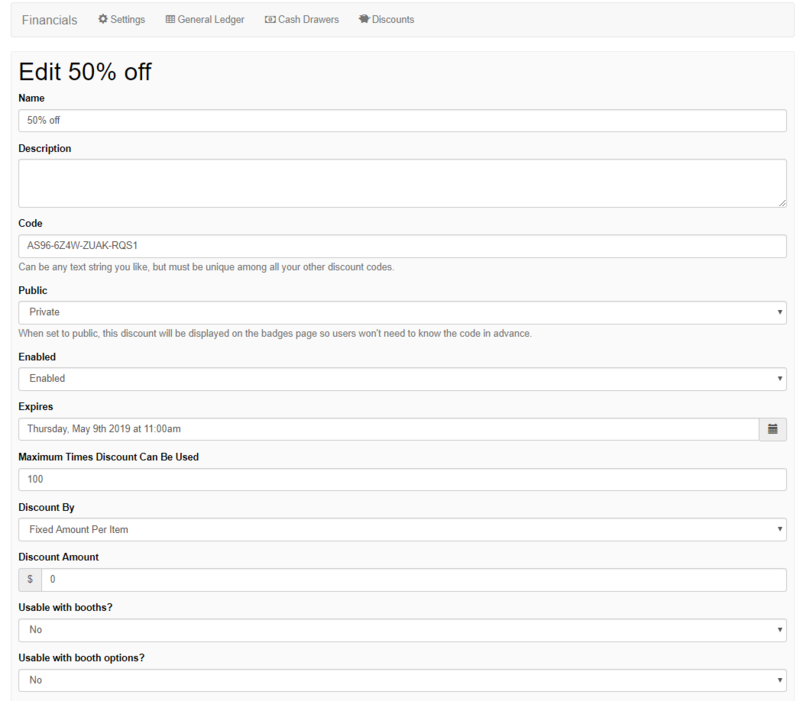 You will also set how long the discount will be active for and how many times the code can be used. To provide contact information for your convention you will go to “Convention Tools> Convention Setup> Contact Info”. 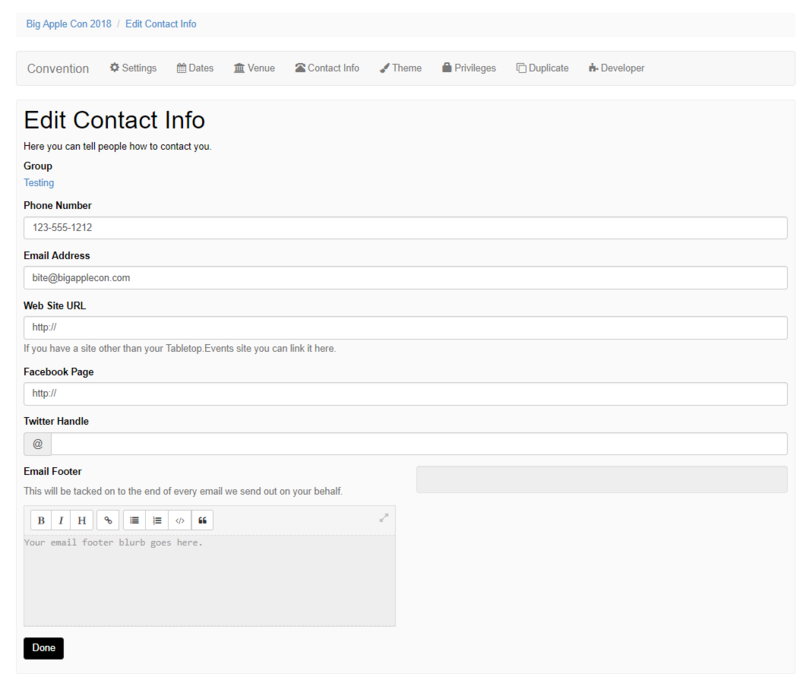 You will then add the appropriate information for your Attendees to contact you along with an Email Footer that will be tacked on to the end of every email we send out on your behalf. Here you can change the look and feel of your convention by either using one of the Presets or adjusting the colors manually. 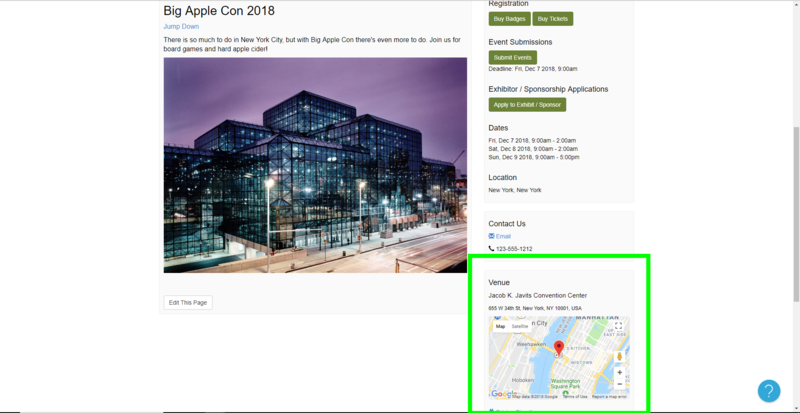 You will see an example of how the convention site will look on the right-hand side of the screen as you change the settings. 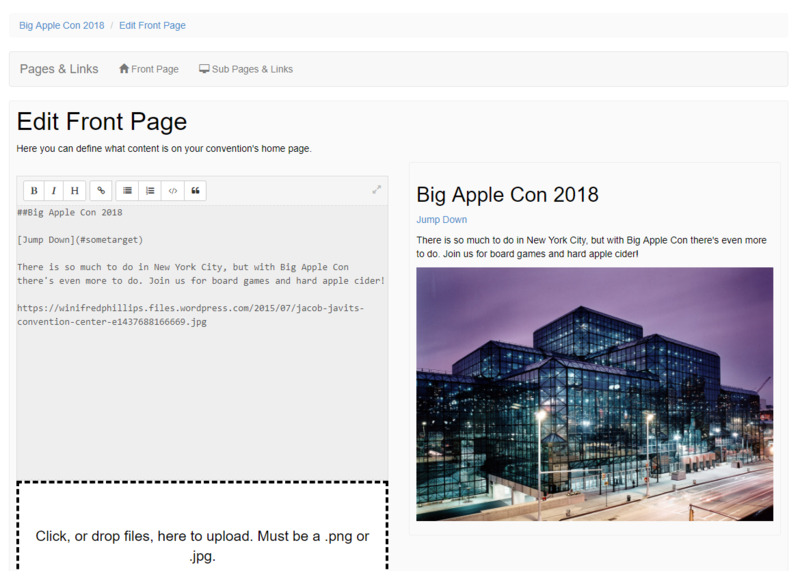 This is also where you will load the Header Image for your Convention. There you will see the option “Should this convention be displayed in our public listings?” when you set that to public your convention will show up in the Table Top Events conventions list. After you have set up Registration for your attendees you are ready to start selling tickets to your convention.